We are providing the following guides and tools to make your ISO 9001:2015 implementation easy and fast. 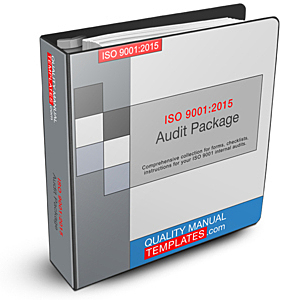 Although we designed our implementation and audit guides to complement our documentation templates, they will add equal value to any ISO 9001 implementation - even if not based on our documentation templates. The ISO 9001:2015 Project Guide is a practical, no-nonsense handbook for ISO 9001:2015 implementation. These step-by-step instructions guide your ISO 9001 implementation project from start to ISO 9001:2015 certification and beyond. The practical guide provides simple yet complete and easy-to-follow instructions, and allows for easy in-house ISO 9001 implementation with minimal resources. The ISO 9001:2015 Project Guide is very business-oriented and ideal for any small to midsize company that's at the beginning of their ISO 9001:2015 implementation. 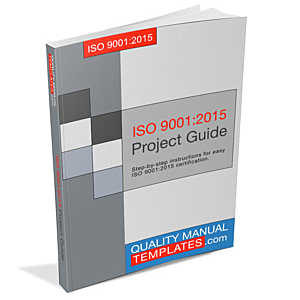 Note: The ISO 9001:2015 Project Guide is included in the ISO 9001:2015 Certification Package. The ISO 9001:2015 Project Guide is delivered through electronic download - so you can start using it today! The ISO 9001:2015 Gap Analysis is a comprehensive questionnaire and checklist that is used to analyze the extend to which your company's processes comply with each and all of the ISO 9001:2015 requirements. The ISO 9001:2015 Gap Analysis is used prior to ISO 9001 implementation in order to evaluate how many ISO 9001:2015 requirements are already met and which functional areas or departments will need special attention when implementing the ISO 9001 quality management system. Performing an ISO 9001 gap analysis is optional but highly recommended as an evaluation and planning tool prior to starting your ISO 9001 implementation. Note: The ISO 9001:2015 Gap Analysis is included in the ISO 9001:2015 Certification Package. 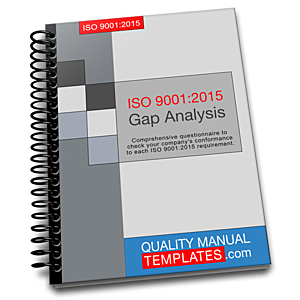 The ISO 9001:2015 Gap Analysis is delivered through electronic download - so you can start using it today! The ISO 9001:2015 Audit Package is designed to benefit any company's internal ISO 9001 audit program. This package will make it easy to set up the ISO 9001 audit program; it will guide the internal ISO 9001 auditor during all steps of the audit, from audit preparation till reporting of audit results. In addition, the Audit Preparation Tips are designed to prepare staff and management for the ISO 9001 certification audit and significantly contributing to its success. Note: The ISO 9001:2015 Audit Package is included in the ISO 9001:2015 Certification Package. The ISO 9001:2015 Audit Package is delivered through electronic download - so you can start customizing it today! Now you can implement ISO 9001 in-house without a consultant! Our ISO 9001 guide, our gap analysis, and our audit forms will make it easy on you. Remember that you can use the ISO 9001 guide with or without our templates, that performing an ISO 9001 gap analysis is an optional but highly recommended planning tool, and that there is no requirement for ISO 9001 audit forms though they are great time-savers.